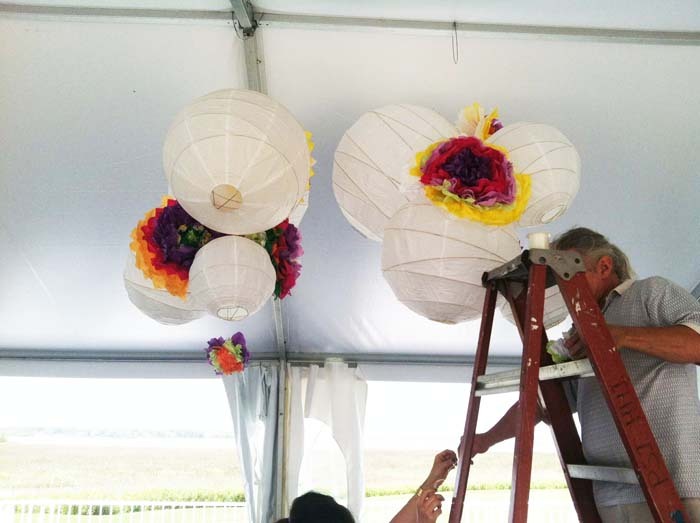 For this DIY I worked with J Banks Designer, Deb Van Plew, to help her create a hanging centerpiece for our hospitality tent at the RBC Heritage Golf Tournament. 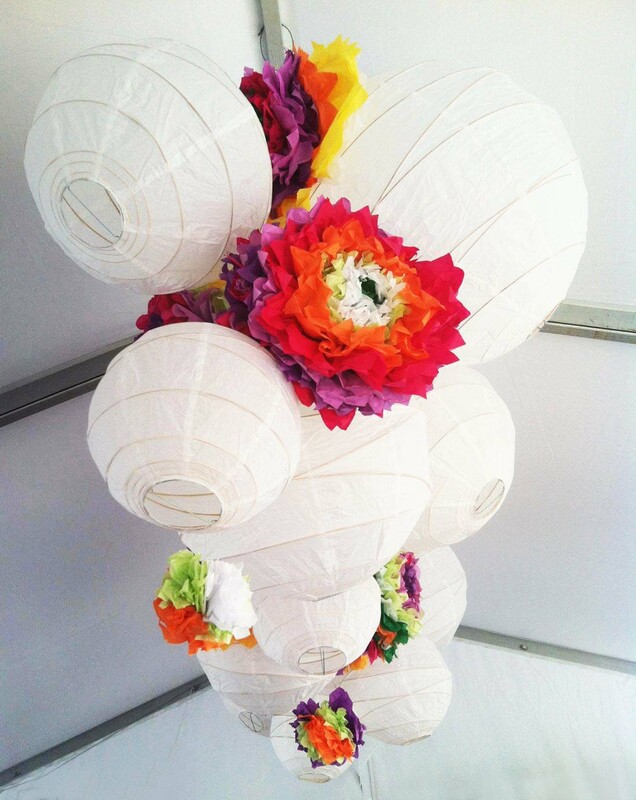 Deb envisioned a huge chandelier-like piece composed of vibrant tissue paper flowers intertwined with white paper lanterns that would provide scale and volume. 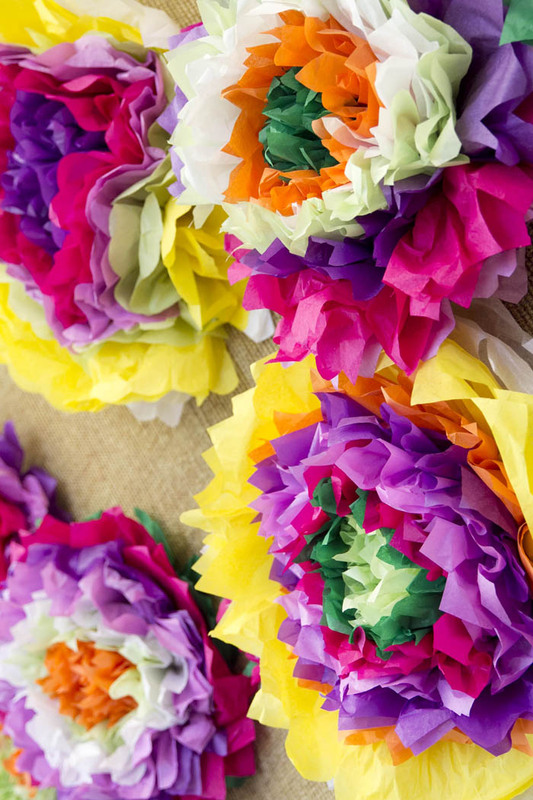 I was so excited to start this project because Pinterest is overflowing with images of tissue paper flowers and poms. One of the things I like about these flowers is that they capture the beauty of flowers but with a quirky and whimsical twist. 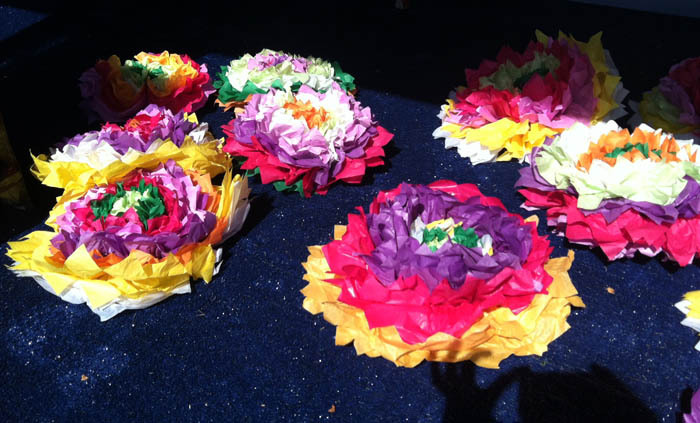 Before we began to assemble the ‘chandelier,’ a few of the J Banks team members and I got together to start making the tissue paper flowers. Step 1. 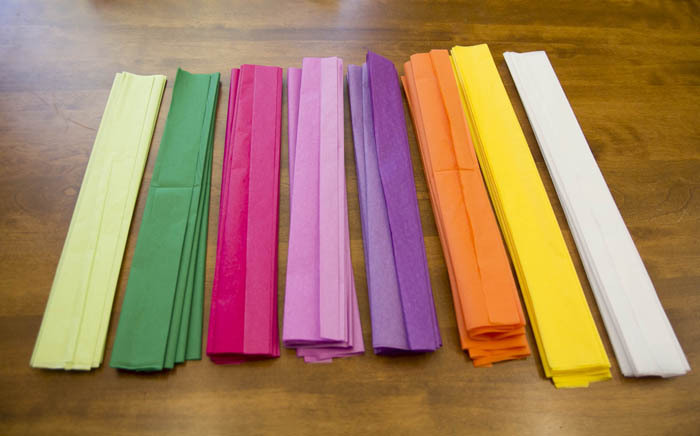 Begin by laying the tissue paper flat and stacking the colors in the order you want them to appear in the flower. I used two pieces of tissue paper per color so that each color would pop! Step 2. 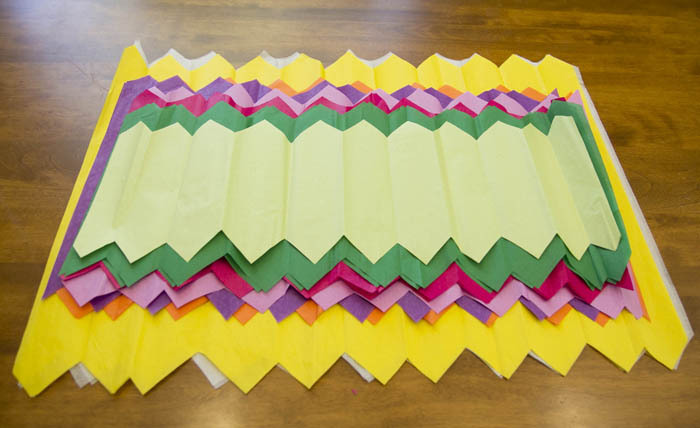 Once you have laid out all of your tissue paper, start at one end and begin folding the stacked tissue paper like an accordian . Try to keep the lines even. 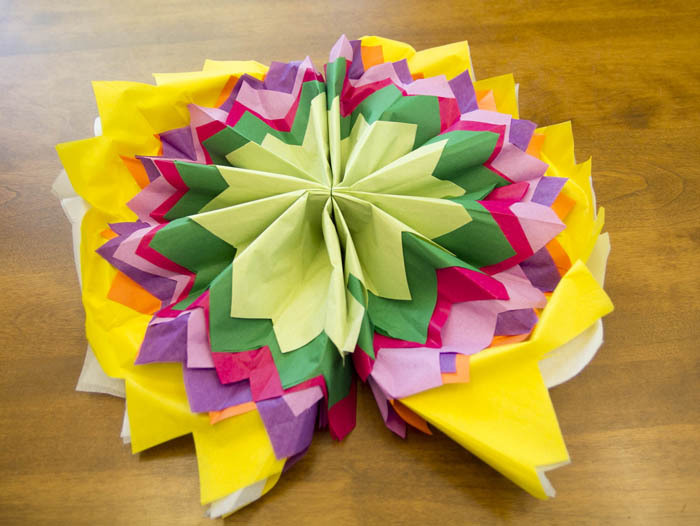 This initial fold will be a guide for you throughout the creation of your flower. Step 3. 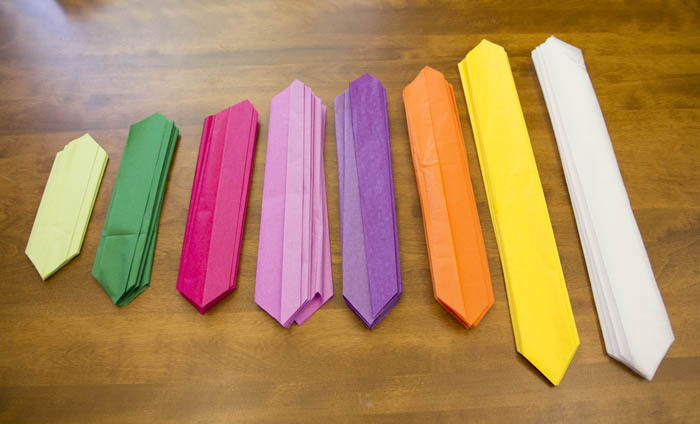 Once you have folded the stack, separate all of the colors and fold them back into the accordian fold individually. Step 4. Lay the colors in the order in which you want them to appear in your flower. 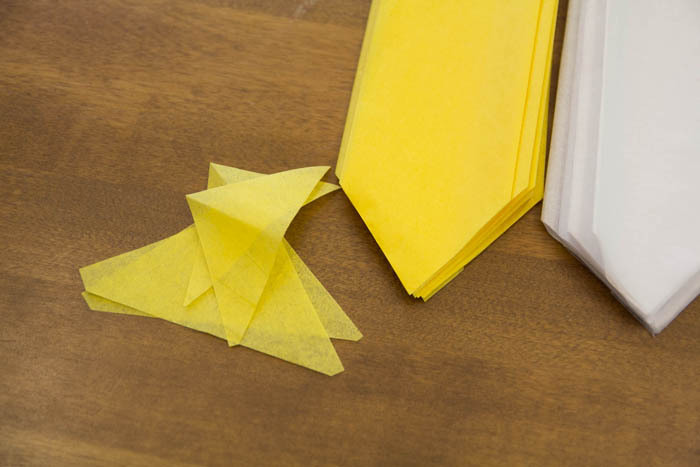 Begin trimming the ends of the tissue paper into curves or triangles. We wanted our flowers to be a bit edgier so we went with the triangle shape. Step 5. 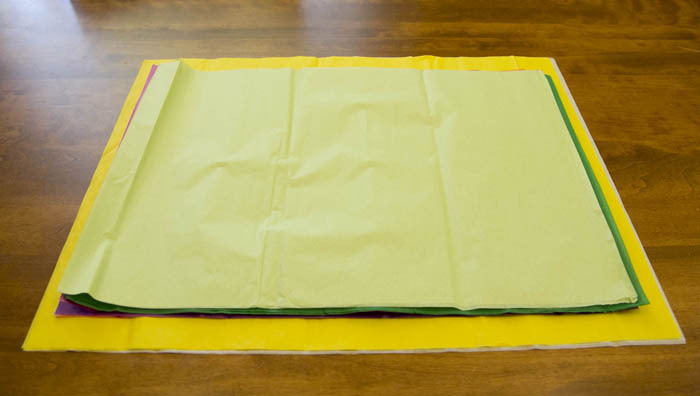 As you are trimming the edges into triangles, begin staggering the length of the various colors of tissue paper. The shortest pieces will appear in the center of your flower and the longer pieces will be on the outside of the bloom. Step 6. 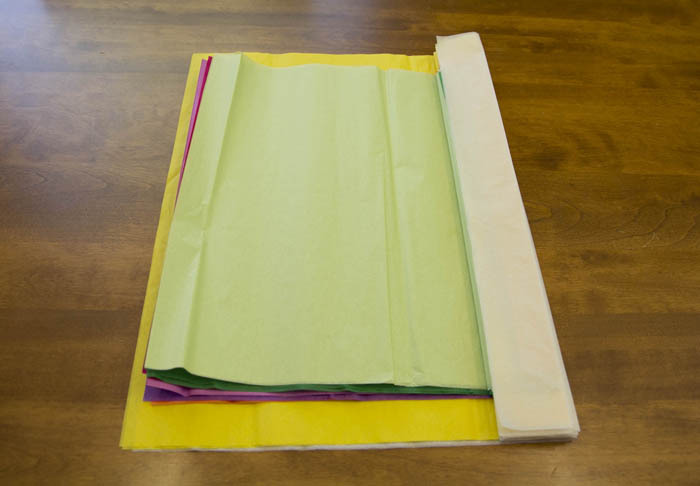 Starting with your longest section of tissue paper, carefully unfold the tissue paper sections and layer them on top of each other (like you did in Step 1.). Step 7. Using your guide lines (from Step 2.) carefully refold the tissue back into the accordian shape. Step 8. 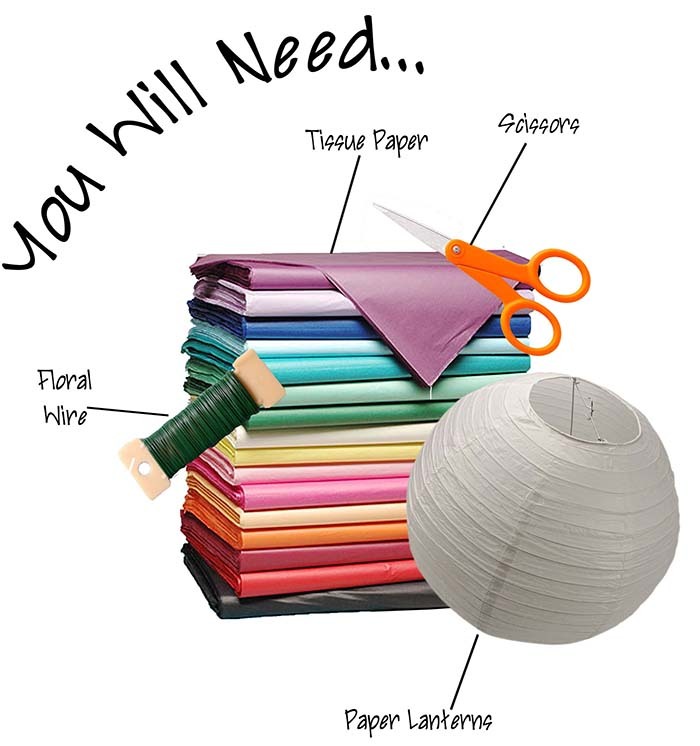 Using a 12″ piece of floral wire, cinch the tissue paper in the middle and then twist the wire on the bottom to secure the fold. Leave the excess wire hanging off the bottom as this is what you will use to secure the flower to the rest of the arrangement later. Step 9. Pull the two inner edges of the flower together and begin to open up the bloom. Step 10. 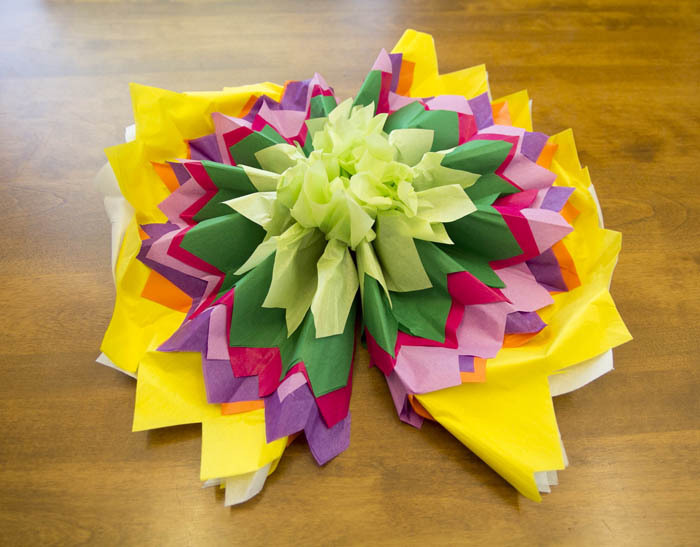 Starting in the middle of the flower, carefully lift each layer of tissue up. 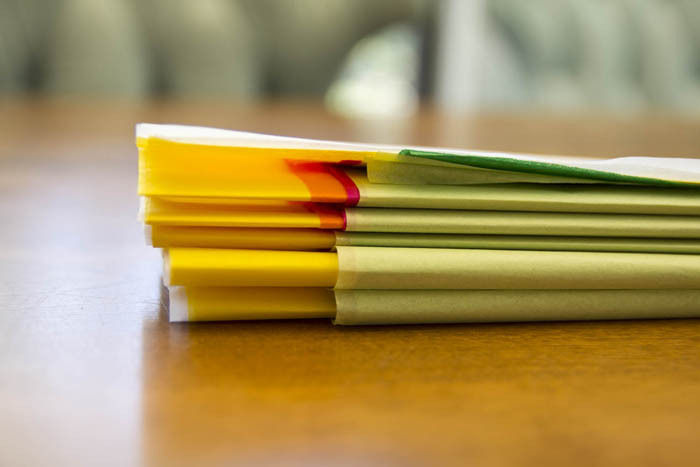 The tissue is thin and you might have a few little tears in the middle where the paper is bound thickly, but that is okay, just keep going and take your time. These little uh-ohs won’t show once your flower is complete. Step 11. 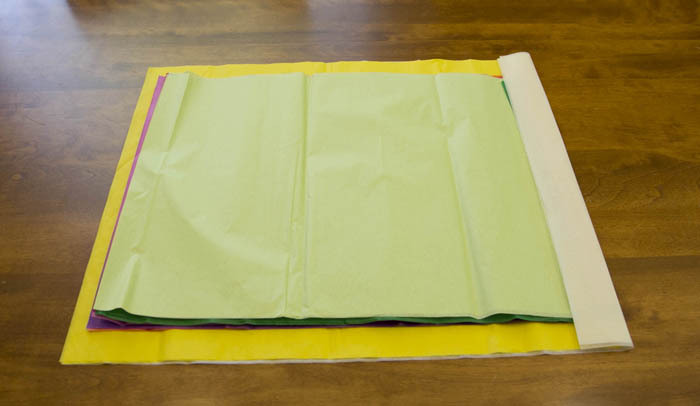 Continue lifting up each layer of tissue paper. Step 12. Ta-Da! 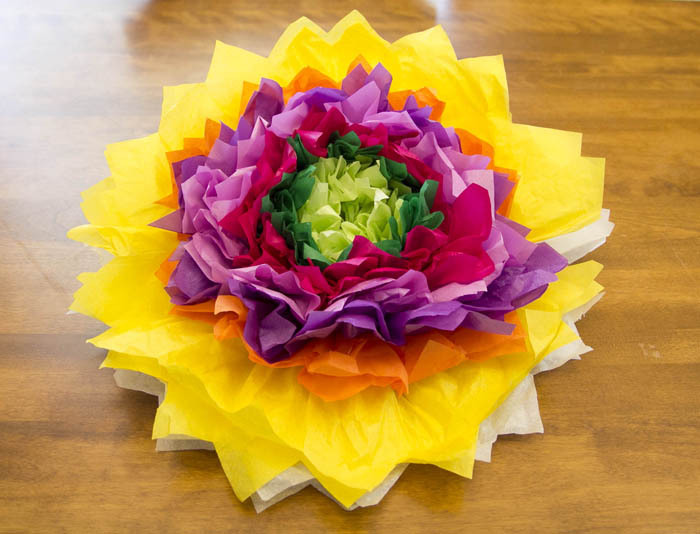 Your have a beautiful tissue paper flower! Store the flowers somewhere safe and dry until you are ready to use them. On set-up day we laid all of the flowers out so we could see our color selection. 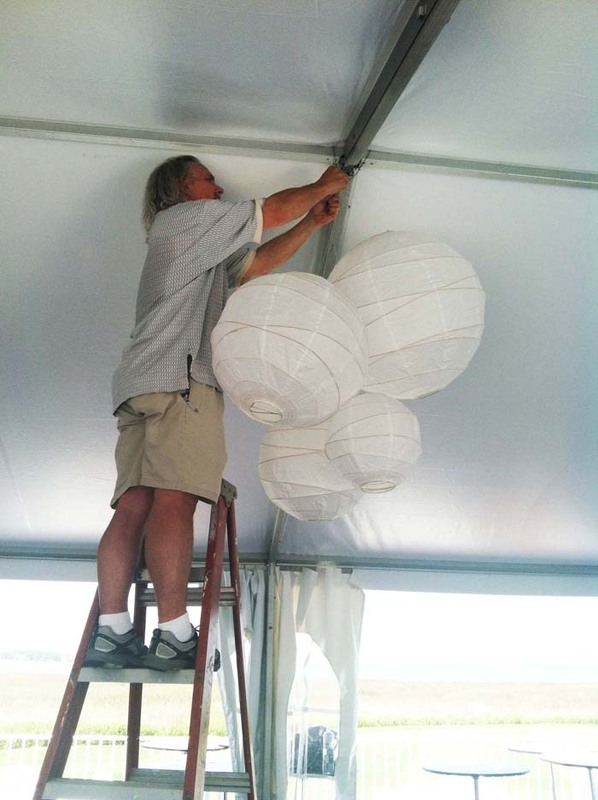 Our friend Gene started to shape the ‘chandelier’ by hanging several of the white lanterns in bunches across the top of the tent. 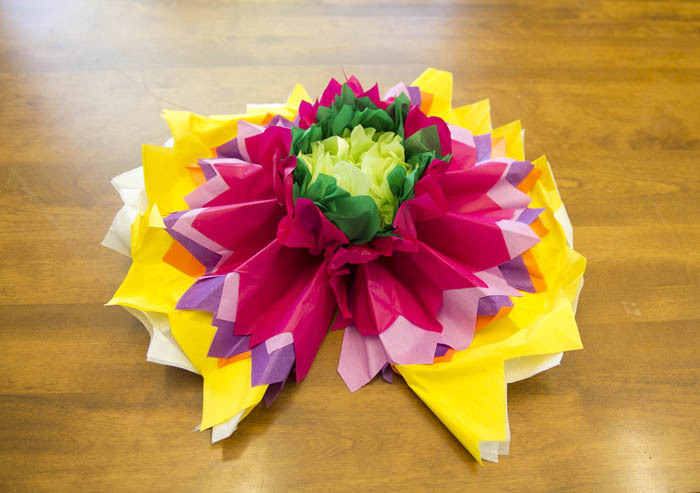 With Deb’s guidance, he began tying in the tissue paper flowers using the wire on the back of each flower. We varied the colors and sizes of the flowers. The asymmetry looked great! 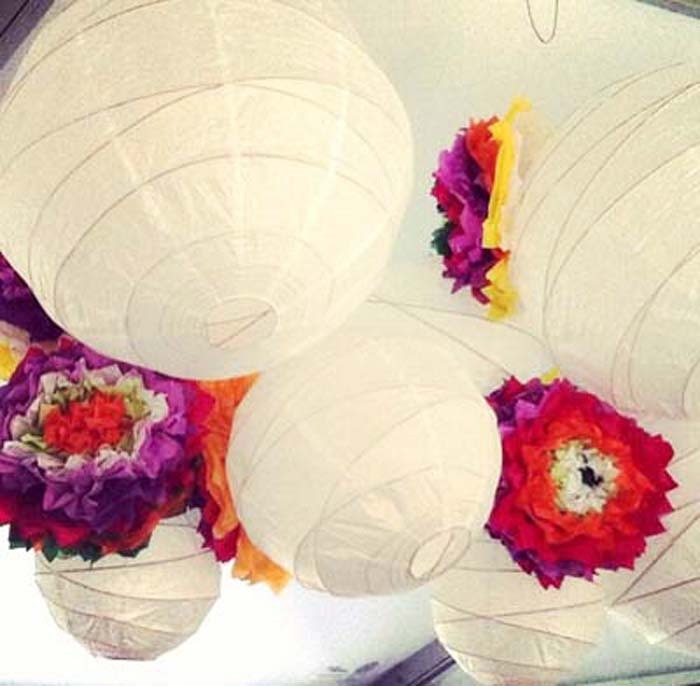 And here is a picture of the finished product – our ‘Paper Flower Chandelier’ was the talk of the tent! After the tournament, we were able to reuse the flowers and lanterns for a retail display! Stay tuned as I will have another DIY project for you again in June! 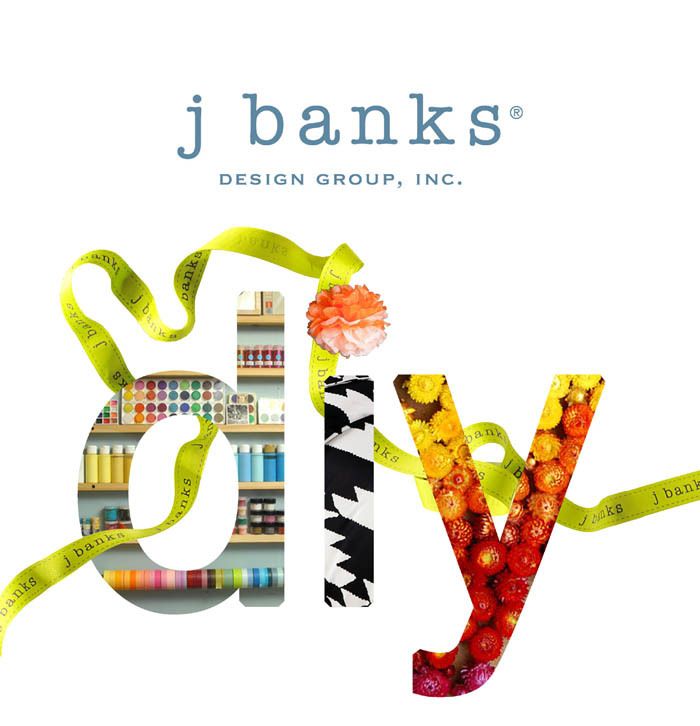 These days the internet is overflowing with DIY (Do-It-Yourself) projects. With so many options and variations out there, picking a project that seems not only fun – but also possible to complete – can be daunting. We decided to take the guess work out of this equation by tackling one DIY project at least once a month. We want to show that we can handle these projects and YOU CAN too! 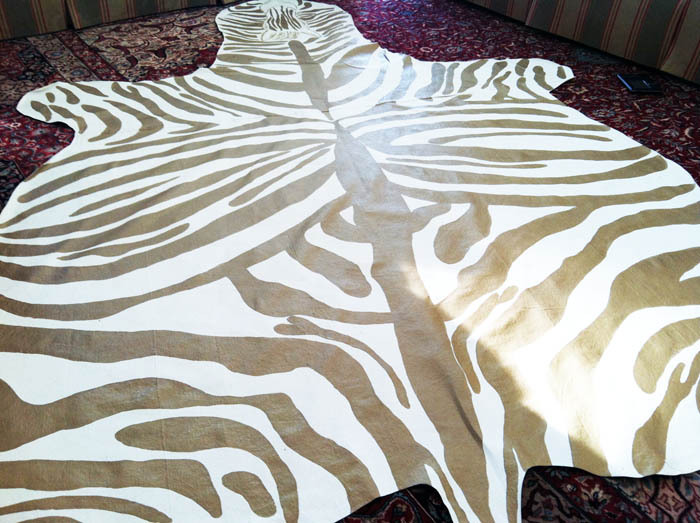 Our marketing assistant, Lauren Thomas, tackled our first DIY project – a Zebra Drop Cloth Rug! 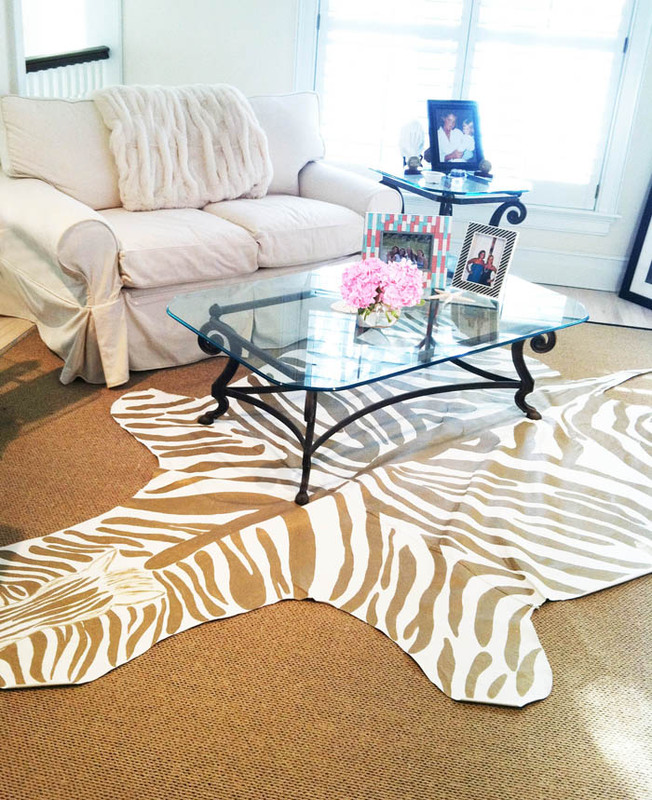 I recently embarked on a rather crazy DIY project – a stylish metallic gold zebra print rug! This project was inspired by the growing trendiness of animal prints, not only in the interior design world, but in all facets of fashion as well! This was such a fun DIY-er and I enjoyed it so much I wanted to share my step-by-step guide and tips and tricks to crafting your very own! 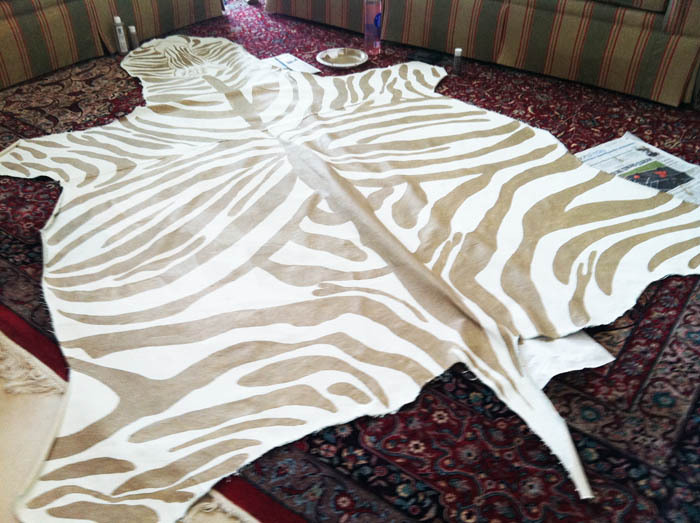 I first began by laying out my drop cloth on a large even surface where it was easy for me to begin sketching the outline of my zebra. 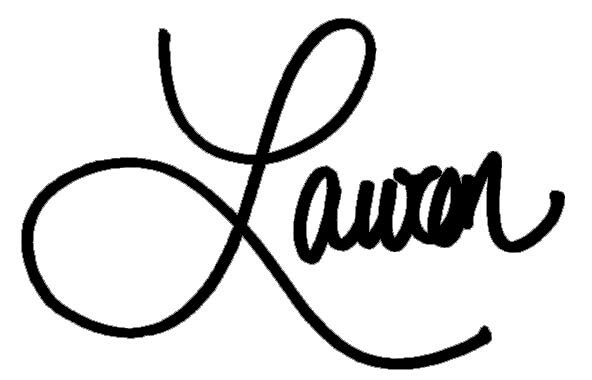 At first, I was a little nervous that the shape would not be perfectly symmetrical, but realized that the less perfectly sketched it was, the more real and authentic the shape would look-so I just went with it! I began sketching with a pencil in case I needed to erase. After I sketched the shape I wanted, I went over the lines with a sharpie, so that I could see the lines more clearly as I was cutting. 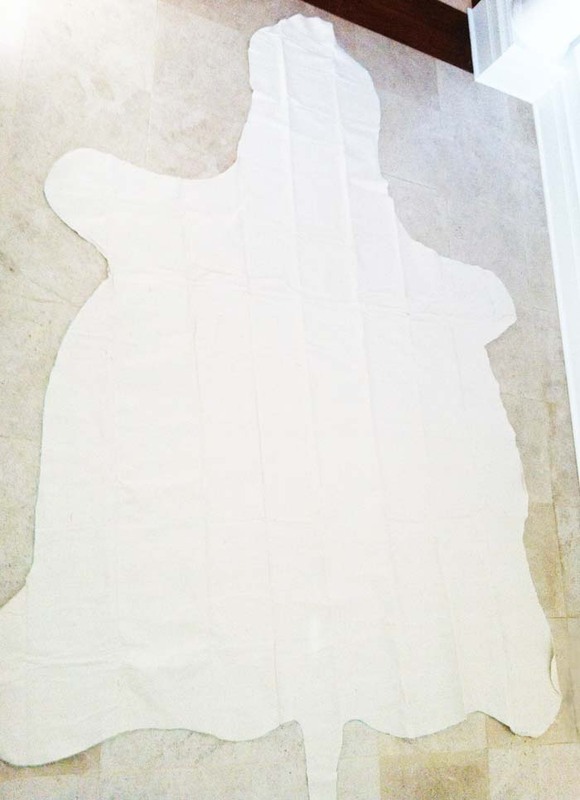 I then cut the drop cloth with scissors and encouraged the edges to fray a bit, in an effort to make the rug look like an authentic hide. 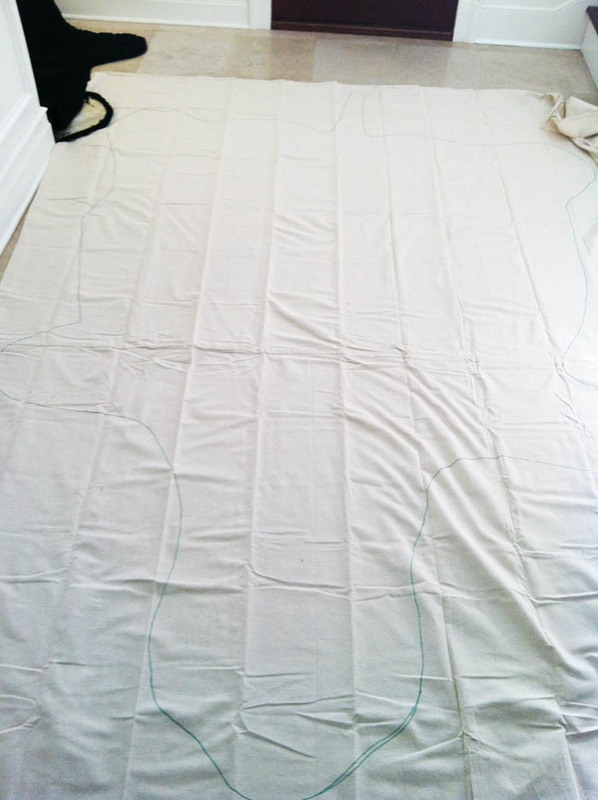 After I was pleased with the shape, I ironed the drop cloth. Ironing makes the material smoother and eases the process of sketching and painting the stripes. Then the painting began! 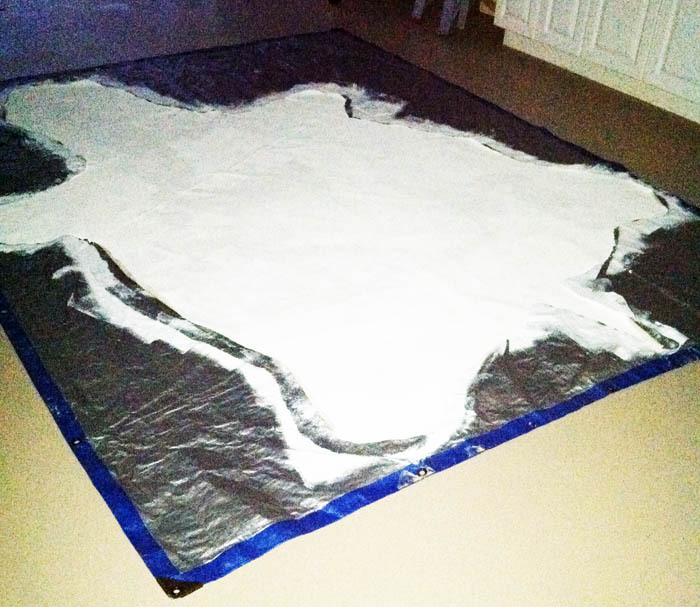 I laid out a tarp that covered the surface area of the rug and began to apply the white base paint. The white paint serves not only as the background but also as a primer for the drop cloth. 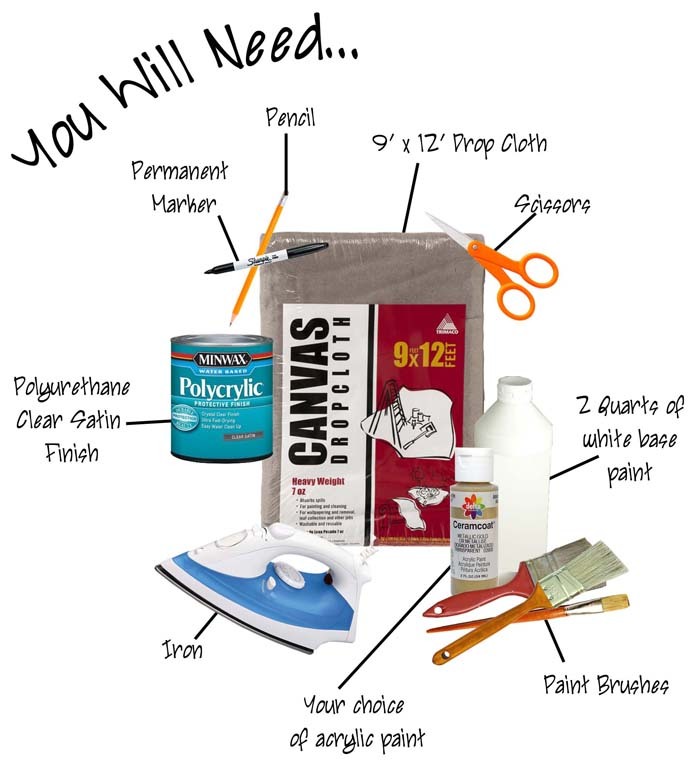 I used more than one quart of paint, as drop cloths absorb a TON of paint. I recommended getting at least two quarts of paint so you can apply generously! It took about three hours for the paint to dry. 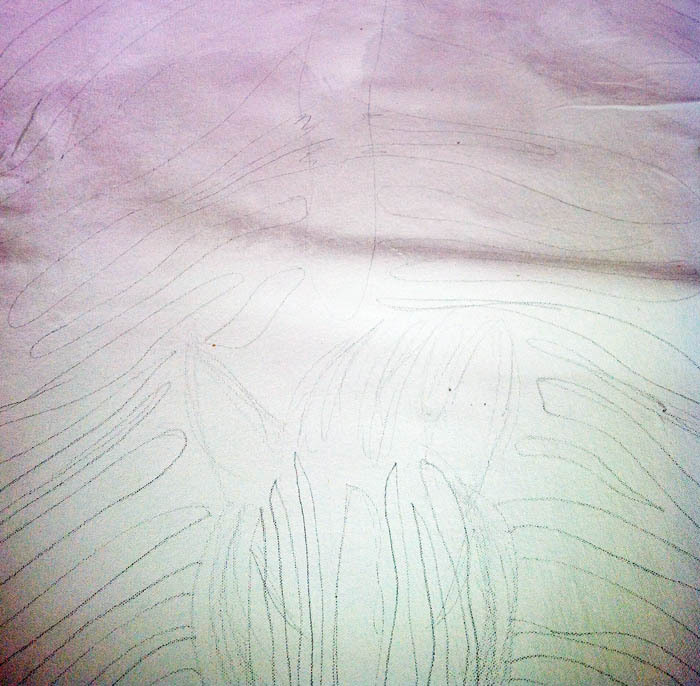 During this time I began sketching my stripes with a pencil. Just remember- no two zebras have the same stripes, so just have fun with it! You really can create any look you want! Once I was happy with the stripes I sketched, I began painting the stripes. This was my favorite step, as I loved seeing the whole process come to life! 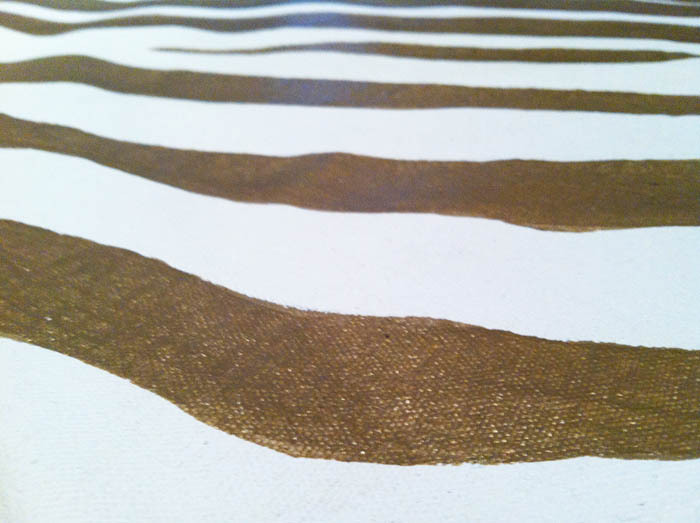 I actually mixed a tannish brown paint with a gold metallic to get a more subdued gold look. I loved how this technique turned out because none of the stripes are the same exact color, as some were mixed with more gold and vice versa. It gives the rug a more authentic feel! If you are happy with your rug with just one coat, then that is great! I chose to go back over the stripes with a second coat to add a bit more color and touch up a few light areas. Once your paint has dried completely (I would let it dry over night just to be sure) you can apply your polyurethane coat. I applied a light coat of polyurethane in hopes that it would increase the durability of the rug. But if you find that it slightly alters the shine or hue of the finish you wanted to achieve, then you should be fine without it as long your rug will not be in a high traffic area of your home. Voila! Not too difficult at all! I ended up putting the rug in my room and layered it on top of the rug I already have in the space.